Patricia Minter follows Wylde’s instructions as she maneuvers through the gymnastics. 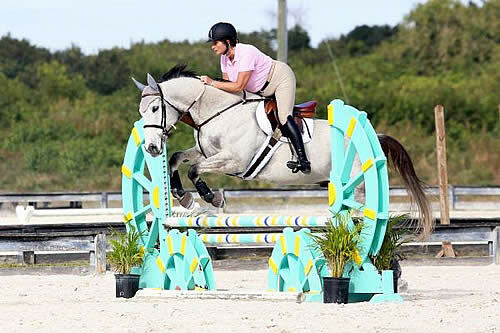 Wellington, FL – January 29, 2014 – Riders and equestrian enthusiasts from all over South Florida gathered at Sunshine Meadows Equestrian Village this weekend to learn from one of the country’s greatest riders, while also supporting a worthwhile cause. Olympic Gold Medalist Peter Wylde generously donated his time in support of Horses Healing Hearts, offering a clinic for riders of varying levels on Sunday, January 26, 2014. Presenting Sponsor, Cavalor, hosted a luncheon with the Gold Medalist prior to the start of the clinic. Riders and auditors were able to ask questions of the expert, while enjoying the food at the Sunshine Stallion Grille. The restaurant was filled to capacity, and the hour flew by as Wylde discussed his secrets to a winning program. Each session consisted of four horse and rider combinations, and Wylde made sure to approach each one with an adept perception of their needs. He worked with them extensively on the flat and then used different gymnastics, including a bounce, to help them collect and balance their horses. By the end of the clinic session, the change in each of the pairs was undeniable. Wylde addressed issues with each rider from positioning to tack and techniques to use at home. His approach was very individualized, and riders could not have been more grateful for his support. Wylde only became an Ambassador to Horses Healing Hearts about six months ago, and during that time he has not only volunteered with the children and raised awareness about the organization, but also donated his time as the clinician for the Sunshine Series Clinic to help raise funds for the non-profit organization. The Sunshine Series Peter Wylde Jumping Clinic was nothing short of a success with sold out riding sessions and over 40 auditors in attendance. Horses Healing Hearts would like to thank all sponsors for the clinic including Cavalor, Tredstep Ireland, Dover Saddles and Sunshine Meadows.